With several weeks still left in the nesting season, the state's sea turtle nest numbers have surpassed the record high (5,198 nests) set in 2013. The number of nests laid in 2015, 5,111, was exceeded last week. This milestone marks South Carolina's third record-setting season out of the last four years. It's also consistent with a broader trend across the Southeast, as states like Georgia and Florida have reported similar record-setting numbers in recent years. S.C. Department of Natural Resources (DNR) biologists who monitor sea turtles are optimistic that the high nest numbers represent the pay-off of decades of conservation efforts -- and mean that recovery of the loggerhead, the most common sea turtle in South Carolina, is on track. "We are very excited to see years of blood, sweat and tears bear fruit with increasing nest numbers. Many folks have toiled away on our beaches to protect nests as the state enacted key management practices, such as use of turtle-excluder devices, to protect turtles in our waters," said DNR sea turtle biologist Michelle Pate. "While nesting numbers are up, there is still work to be done here in South Carolina and globally protecting turtles from hazards in the water and their nesting habitat on land." Sea turtles are large, ancient reptiles that spend the majority of their lives at sea, where they eat crustaceans, algae, and jellyfish. 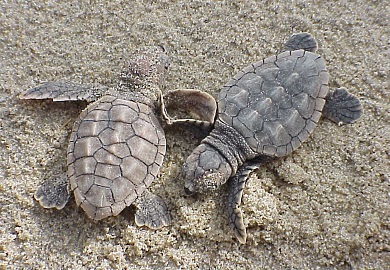 Four species nest in South Carolina: the loggerhead, green, leatherback, and Kemp's ridley. Beginning in May, mature females come ashore to dig holes in the sand and lay clutches of leathery, ping pong ball-sized eggs. After two months, juvenile sea turtles emerge from these nests and crawl to the shoreline to begin the cycle anew. South Carolina celebrated its first hatched nest of the year, laid by a loggerhead at Edisto Beach State Park, on July 9, 2016. Since the late 1970s, a team of DNR staff, partners, and hundreds of volunteers have made up South Carolina's sea turtle nesting network. These dedicated individuals scour state beaches each spring and summer in order to count, protect, and inventory sea turtle nests. "We're grateful to all those involved in making this a successful sea turtle year in South Carolina," said Pate. Keep Lights Out! on beachfront property during nesting season. Refrain from using flash photography on the beach at night. Keep our beaches and ocean clean. Trash items such as plastic bags and balloons can cause injury or death when sea turtles mistake them for jellyfish, a favorite food. Respect sea turtles by observing them from a distance on the beach. Report dead or injured sea turtles and nest disturbances to DNR at 1-800-922-5431. Report sightings of live, healthy turtles to DNR at http://www.seaturtle.org/istor. Promote and support our program for continued conservation of sea turtles in South Carolina through purchase of a specialty vehicle license plate or Check for Wildlife on Form I-330 on your state tax return.